Perma-Columns are precast concrete columns that are an alternative to preservative-treated wood thus ensuring the structural integrity of your building’s foundation, a simple and efficient construction method that allows an affordable concrete foundation with no mess or concrete cure time. Sturdi-Wall (SW) and Sturdi-Wall Plus (SWP) brackets are a heavy-duty engineered anchoring system that attaches the wood column to concrete foundations. 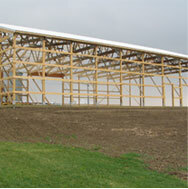 They are generally used in the post frame industry but have other applications as well. These brackets are made with 1/4" steel plate, A706 rebar in either #4 or #5 size, depending on the model. Each bracket is precisely welded to meet engineering specifications and given a professional look with a baked polyester powder coat finish. 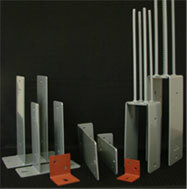 Some brackets are available in a Hot Dipped Galvanized model for use in more corrosive environments. 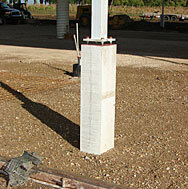 We continue to get requests for concrete columns that are specific to our customers’ needs. A few of our products are listed here to show the endless possibilities. The same dedication to quality found Perma-Columns is found in these products as well. 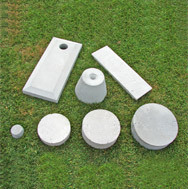 Concrete bases use our Self Consolidating Concrete (SCC) pre-casting technology that includes superplasticizers, micro silica and an admixture that provides freeze/thaw protection. In some instances, a corrosion inhibitor for rust protection of steel reinforcements and microfibers are added to the mix. Our mechanically laminated wood columns use #1 SYP grade lumber. No wood treatments are needed. Each column is manufactured to ANSI / ASAE EP559 specifications and allow a perfect fit to the Perma-Column pocket. The wood to steel connection is made with two 1/2” diameter bolts in double shear and 1/4” x 3” screw fasteners (SDS) by Simpson Strong-Tie or are equal in single shear installed from each side. 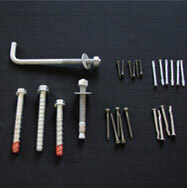 One or two screws – depending on model – are installed from each side of the bracket at each bolt. Screws help prevent stress concentrations around the bolt which would cause the wood members to split. All hex head bolts used in our hardware packages are A325 (Grade 5) unless otherwise noted.